In this post, I am going to show you how Modern Coast Online booking is done.Online booking in Kenya is fast gaining traction thanks to high mobile penetration in the country. You should not be left behind. And why must you read on? Because I am going to show you how to book your ticket online and avoid the trouble that comes with traveling especially when so many people are traveling. It is important to discover these simple tricks that will save you time, money and stress. I have been using them for a few years now and I think it is only good that I share what I know with you. Now let us do this. It takes you to a page that looks this way. Entering the town, city, or place you leaving. Select the currency of your country. Choose whether you want a return ticket. Once done, hit the search button. If successful, you will go to a page that looks this way. If there are any buses available, you will be shown. In my case I was searching a bus from Kisumu to Nairobi. As you can see it shows the bus type, route, reporting time, and the cost of the seat. Now choose the bus available to choose a seat. This takes you here. From the screenshot, you can see the seats available and those already booked. Orange seats shown are the ones still available while those that are white are already booked. This bus seems to be almost full as you can see. Now choose by clicking on the seat you want to occupy. Then hit submit below the page. This screenshot does not show that but yours should as you scroll down the page. This takes you here. Here you fill details required, which include, your name, email, phone number, ID or passport and nationality. If you have a discount code, you also need to enter it here. Lastly enter your card number if you have one. If you scroll the same page there is a section that looks this way. This is the payment section and all you have to do is to choose the payment option that suits you. As you can see you can either pay via Mpesa or Visa Card. Once done, the next page confirms that your seat is reserved and that you need to pay the amount due within 15 minutes, otherwise, your reservation will be cancelled. See image below. 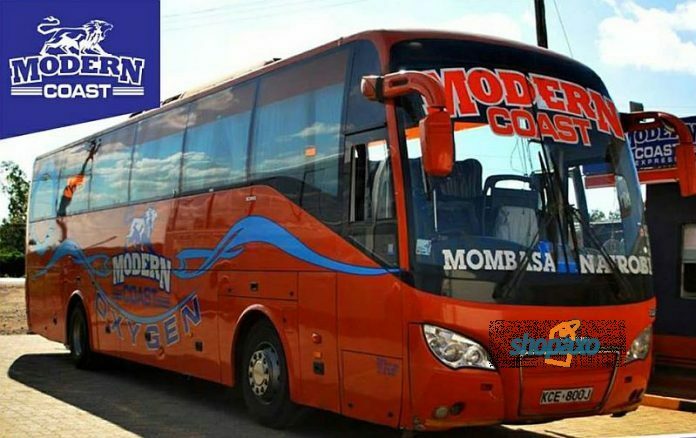 Meanwhile you will receive a message from Modern Coast Online booking on your phone. Here is a sample. Go to MPESA paybill number, enter business no. 525600, enter account number TSQ564, amount KES 1200. Now all you need to do is pay within the time given and wait. After successful payment, you will receive an email to that effect. Here is a sample. There you have your ticket. You can print it and present it on the day of travel. That is how Modern Coast Online booking is done and it is as easy as that. If you intend to travel during the festive season, when there are so many people traveling, I would advise you to book as early as possible. Sometimes people book up to a month or two in advance. If you like this article, you can pay it forward by sharing with friends, family and work mates. Better still hit the subscribe button and get more of these travel guides to your inbox. Previous articleKPLC Paybill Number: How to pay your electricity bill.